There has been a lot of talk about what is in children’s makeup products, especially because many of these products are made in China with low quality and cheap ingredients. In the recent past, there have been dangerous chemicals found in children’s makeup products. However, it is not just makeup that we should be worried about. Many nail polishes are made with the same ingredients as car paint, which are not so good for adults, but are even more of a danger for children. Just think about how many times a day that your child puts their hands near their face or in their mouths. Nail biting means they are ingesting all the chemicals that are in the nail polish. There are chemicals that are damaging to our health. Many of these chemicals have been removed from many popular nail polish brands, but they are not banned from being used in nail polish. Here are the chemicals that should not be in your children’s nail polish. This is used to minimize chipping. Phthalates are endocrine disruptors and mimic estrogen in the body. They have been proven to impair the hormonal development of fetuses, to cause damage to the organs and could cause the early onset of menopause. Toluene is used to help create a smooth finish and application. It has a pungent sweet smell and is found in most nail polish removers. Toluene fumes are highly toxic. Studies have found that toluene exposure can decrease brain function, neurological, nausea, impaired breathing and even hearing loss. Formaldehyde is used to strengthen and harden nail polish. It is also used as a preservative against bacteria. Most times, large or long exposure to formaldehyde in the air or on the skin may lead to cancer in the blood, nose or throat. Nail salon workers and their children are at the highest risk for the chronic health problems due to formaldehyde exposure. Formaldehyde exposure can cause nausea, convulsions, miscarriages, and asthma. This is a by-product of formaldehyde and is often found in nail polishes that contain formaldehyde. There has not been a lot of research into the side effects of formaldehyde resin. Preliminary studies found that formaldehyde resin can cause loss of nerve sensation, skin depigmentation, allergic reactions and skin irritation. Camphor is used to make a glossy or shiny appearance when the nail polish is dry. This is one of the least toxic ingredients on this list and is used in some cold remedies, including nasal sprays and vapor rubs. It can cause severe allergic reactions and skin irritations when it is applied to the skin. The fumes from camphor can cause headaches, dizziness and nausea. Xylene is a solvent that stops nail polish from getting gloopy. It is a known allergen and it is a possible carcinogen. This is a plasticizer that helps transforms the nail polish from drippy to dry within a few minutes. This chemical has been banned from being used in personal care products in Europe. It is still allowed to be used in personal care product in the US. The European ban is due to Ethyl Tosylamide’s antibiotic properties because there are concerns over it causing an antibiotic resistance. This is a potent toxin that is present in gel manicure products. While it is considered safe in small amounts, it can cause brittle nails and dry skin. Gel nails also need acetone to remove the product from the nail, which will weaken the nails. Acetone is present both in nail polishes and nail polish removers. It is also used to remove glue and is also a paint stripping. It is super drying on the nail and the skin, so it can cause splitting, peeling and breaking of the nail. The fumes are dangerous and can cause headaches, nausea, vomiting, dizziness confusion and irritation of the throat and nasal passages. It can also cause unconsciousness and damage to the eyes. Long-term exposure to acetone can lead to chronic irritation of the respiratory passages, irritability, mood swings and weakness. Nail polish removers are handy to take off nail polishes, but they are also full of chemicals. Most nail polish removers are made from acetone. They can also contain toluene, phthalates, fragrances, and methyl ethyl ketone. There are nail polish removers that are made without these harsh chemicals. 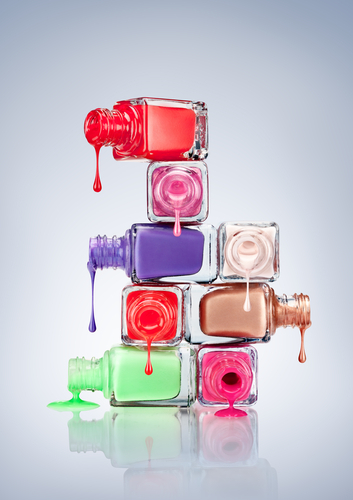 Water-based nail polishes can be removed with just hot water and by scraping the polish off. UV lamps or ultraviolet lamps are used to dry gel nail polishes. There are many home models. UV lamps deliver the same hazardous rays as tanning beds, but it takes many manicures to cause damage. It is possible for UV lamps to cause skin burns. Exposure to the UV lights can also increase the risk of skin cancer. There are some nail polish ingredients that are naturally occurring, but this does not mean that they do not have their own set of health hazards. Mica is a mineral that is used to add color, shimmer and sparkle to nail polishes. However, the production of mica relies heavily on the labor of women and children who mine in dangerous conditions. Mining mica increases the risk of bronchitis and asthma. There is also the risk of the ground collapsing during the mining of mica. Nail polishes cannot be thrown out with regular garbage because of all the chemicals that are in them. Most cities have nail polish listed as a hazardous waste product, right next to house paints, car batteries and insecticides. Simply thinking about the fact that nail polish has to be treated like motor oil and battery acid makes it worrying about what we have been exposing both ourselves and our children to. Even empty bottles of nail polishes cannot be recycled, because of what they are made of and the chemicals in the nail polishes. What Nail Polishes are Safe? Labels can also help you find nail polishes that are safer for you and your children. There are many brands that are 3-free, which are free from Dibutyl Phthalate or DPB, toluene, and formaldehyde. There are also 5- free, 7-free and 10-free nail polishes available. Most of the time, nail polish and other beauty products can contain a huge amount of harsh chemicals. However, there are many natural and less dangerous options to pick from. It is always recommended that you do your own research into the nail polish brands before buying the nail polish. Many times, health food stores have great options to pick from. Making the change to better options has never been easier and reduces the risk of health concerns for children.